Now the VMP will be able to access and read the contents of the disk. 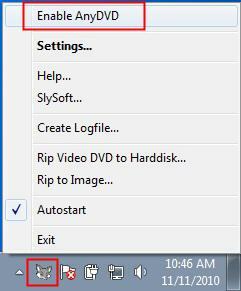 To see if AnyDVD has removed the protection of the disk, go to where your drive/burner is listed and right click on your drive where the Blu-ray disk is inserted, and select "Open"
Once DVDFab Passkey is installed, launch it so that in the bottom right hand corner of your computer you see a little icon in the shape disk with a key laying over it. If the icon is not in color that means Passkey is not running actively. To have it run, right click and select "Enable DVDFab Passkey"
To see if DVDFab has removed the protection of the disk, go to where your drive/burner is listed and right click on your drive where the Blu-ray disk is inserted, and select "Open"
If you see a folder with the name "AACS" then the protection has not been removed. Close and reopen DVDFab Passkey to try and refresh it so that it detects and scans the disk again (make sure you are using the latest version of DVDFab Passkey) .